As evidenced in the bio on the website and in the interviews he’s given to Comic Books and Cookies and Pages and Panels among others, Neil Gibson is a man on a mission; to further his love of comic books by getting them into as many pairs of hands as he physically can. A tall order, of course, but one which can be easily met if you’re making something you believe in. And with the likes of Twisted Dark, Twisted Light and Tabatha making the rounds, Gibson is all set to find audiences in all kinds of genre. While the former two titles are polar opposites of the short story anthology medium – Light in particular being my personal favourite – the first issue of Tabatha looks to be rather a scary little number indeed. The Twisted stories, by their very name, are stories which take a bit of a turn along the way; as he quickly draws the reader into the worlds of characters of all walks of life, Gibson manages to nicely tell each story in the few pages given over to them, while also keeping the reader guessing on the ones which he carries off most successfully. 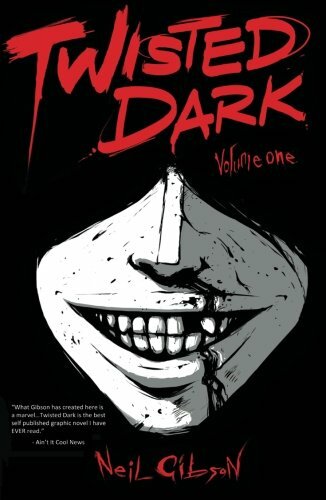 The Dark compilation is just that; a sketch of a nightmarish reality brought home by the stark, almost hopeless vignettes he draws up, while the Light collection is a lot more slice-of-life and, while not equally as gripping, does exactly what it says on the tin in establishing a lighter side to Gibson’s work. And speaking of drawing, Gibson’s collaborations with a different roster of artists for each individual story is a very nice touch; each one adds a brilliantly different atmosphere to proceedings like Caspar Wijngaard’s harshly-pencilled take on Routine (Wijngaard is also the artist on Tabatha) or Ant Mercer’s bold take on a psychiatric patient’s lessening grip on a so-called reality in The Game. By getting his work out through T-Publications , Gibson shows great ambition in developing his own little comic empire, and I for one am very excited to see where Neil Gibson’s love for the medium will lead him and his fellow talents next. ← 100th Post of Geekdom!